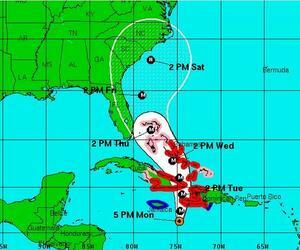 The Cuban Institute of Meteorology said the provinces from Camagüey to Guantánamo must remain very attentive to the evolution and future trajectory of intense hurricane Matthew, which represents a danger to eastern Cuba. Due to the large area of clouds and the wind field with tropical storm force accompanying this hurricane, the provinces of the central region should also pay attention to this tropical cyclone. During the last hours, Matthew has maintained little change in its organization, slightly decreasing in intensity, with maximum sustained winds now of 215 kilometers per hour, with higher gusts, so it continues as a major hurricane category four on the Saffir-Simpson scale. Its minimum central pressure is of 943 hPa. In the last hours, the course of this dangerous hurricane was near north, at just 9 kph. At 6am Matthew´s center was estimated at 15.3 degrees north latitude and 74.9 degrees west longitude, position that places it at about 540 kilometers south of Santiago de Cuba, 525 kilometers south of Guantanamo and approximately 365 km southeast of Kingston, Jamaica. In the next 12 to 24 hours, Matthew will continue with similar direction, gradually increasing its speed, with fluctuations in intensity, but will remain a major hurricane. The winds with tropical storm force will begin to be felt in south eastern provinces since late Monday night, with a gradual increase in rainfall. There will be heavy swell in both eastern coastlines, with coastal flooding in the south eastern coast and at the end of the night on Guantanamo northern coast.